To celebrate the impending release of Open Design’s Soldiers of Fortune sourcebook for 4th Edition Dungeons & Dragons, author Matt James brings you additional material for a military campaign. During the last encounter, the PCs located the entrance to the abandoned dungeon and were attacked by roaming giant camel spiders. Now, they must enter the dark and mysterious complex. Entering the decrepit and decaying entrance, you enter a room of wonders. Softly glowing sigils and runes provide an ambient light, and the temperature difference sends chills down your back. An exit descends beyond your vision, yet magical protections seem to prevent further progress. 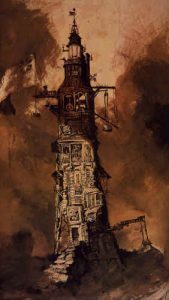 The PCs have entered the very top of an ancient Zazerlae wizard’s tower, possibly one of the tallest buildings in the ancient society. Only a skilled arcanist can bypass the entrance’s wards, allowing the party to continue their journey into the depths. Goal: The PCs are trying to gain access to the tower. Victory: The PCs successfully decipher the ancient arcane lock and safely access the tower complex. Defeat: The PCs inadvertently (or perhaps purposefully) activate the arcane lock’s defenses. Each PC loses 2 healing surges. Arcana DC 15 (1 success, 3 maximum)—You read the sigils and runes that pepper the entrance. You understand the magical sequence used and can begin unlocking the door. History DC 22 (1 success, 1 maximum)—You once studied this period, and you recall the ancient society that dwelled here used these protections on many of their buildings. Insight DC 15 (1 success, 1 maximum)—Judging by the sequence of the runes, you can puzzle out how they fit together. Perception DC 10 (no successes, 2 maximum)—You locate key markings on the door that help you understand the sequence. If successful, the next Arcana check used to decipher the runes and sigils receives a +2 bonus. Continue on to the next encounter. To follow up–with my own personal take on Skill Challenges in 4–you should be very flexible when conducting the challenge. Meaning, while the layout of the SC is presented above, allow your players to use any skill they think is applicable. Never say “no”, but let them know that not everything will have its place and that failure can be obtained equally by being reckless. This will help your players develop creative solutions to overcoming obstacles such as this, without training them to think in purely mechanical terms. If a player uses a skill that might not quite fit, but has a creative use for it, assign a DC (HARD) check to it, etc… if you would like a more succinct description of what I am saying, let me know and I will try to have it put into a post on the forum. Not sure I got your point there, but my own experience with SCs is decidedly mixed. Eventually I sort of abandoned them as not doing what I needed. OTOH… Love a creepy tower. To add some danger to this, though, what about a foe approaching or the like, to add rising tension to the scene? I would very much advocate adding the suspense of approaching foes. Encounter #3 has some that you could easily add to create some tension (keep an eye out for it!). I am in a similar boat as you, Wolfgang. I have largely abandoned the official SC system as presented–and use skills more to advance the story in some fashion. While I still incorporate ‘Success’ and ‘Failure’–it is less rigid and more fluid. I award my players for ingenuity over all else. That being said, their effort in overcoming something non-combat related needs to be genuine. Does anyone use skill challenges? It seems like anyone serious about the game discards them for freeform storytelling with a smattering of skill checks. I think, as presented, it offers a good Skill Challenge, but one capable of bottlenecking the party. What happens when failure occurs, other than the loss of two healing surges? The way it reads, there’s nothing to move the action forward besides trying the door again. I think I would have preferred to see the party lose a surge as a guardian construct or creature was released–which jams the sally port door. The party can fighting their way to the door, simply defeating the construct, or making a run for it. This might also set off alarms inside the tower, alerting monsters to the intruders. Regardless, the party pays a consequence for failure with the surge, has an opportunity for making meaningful choices with the combat, and still drives the adventure’s progress with the malfunctioning portal. @metadm: Check out _Courts of the Shadow Fey_, it’s got some great skill challenges. My initial inclination was to incorporate a puzzle challenge here, but time would not permit that. Here is my take on skill challenges…. A. I like the general idea of formalizing the use of skills in certain situations that are especially challenging. B. I think skill challenges should never have a blocking failure condition for the story, ie the continuation of the story should never depend on them. They can be a planned branching point however. D. I typically allow any skill to be used and I also award an automatic success for anything that simply seems like a great idea while even bad ideas can have a roll unless the encounter spells out an auto fail. E. I don’t always stick to a hard number of successes. I’ll sometimes stop when it “feels like enough” but I keep the hard cap on failures. I find the published counts for 4e were too large and often half as many success/failures are better unless its a very complicated, multi stage skill encounter. I think the take away from the mechanic is that sometimes more than one skill check to overcome an obstacle is fun, but if its too formalized it can break the flow of story telling.